The location also needed to be facing the right direction. I wanted to get a composite photo that accurately showed the position of the moons in the background. All of the locations we were finding were facing the wrong direction – if I photographed at these spots I would have had to shoot from the back of the church which in all locations led to a boring foreground. That is until we got to La Santa Rosa de Lima, just outside of Abiquiu. It was suggested to me that I check this place out by my friend Miya Endo who is an artist and does wonderful raku pottery. 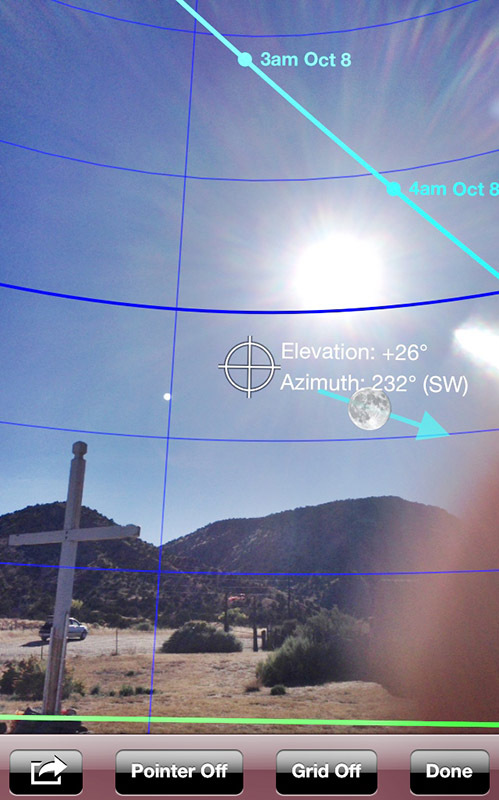 I have an app on my iphone and ipad called Moon Seeker which gives you a virtual reality view of the position of the moon on any given date using the camera. 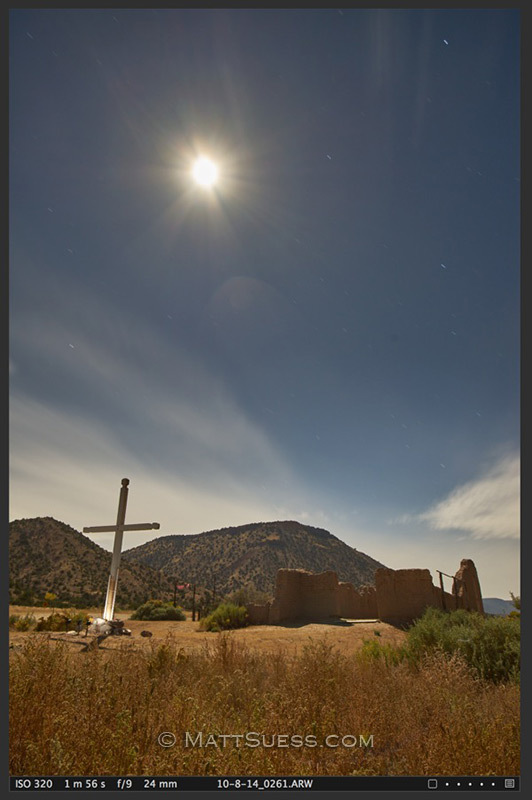 I walked around the church – which is an old adobe structure built in 1734 – and found my perfect shooting location. I got just over 3 hours sleep before Christine and I left Santa Fe just after 1:00am, getting to the location a little after 2:00am. This gave me a little over an hour to get in the right position, get my two cameras set up, do some exposure tests, and figure out how I was going to do some light painting to help bring out the details of the church. If you have ever been to this area at night you will know how dark it is. Far away from any cities there is no light pollution and no street lights. When the moon was full it was quite bright out. But during the total eclipse (which started at around 4:25am) when the moon was red, it was dark enough to see the milky way. The only illumination was some faint spotlights on the base of the cross and headlights from the rare car that traveled by at that early hour. That is not the sun in this photo but rather the moon! With a full moon and long exposure it almost looked like daylight just before the eclipse started. During this time of darkness was when I really went to work. I took my hiking headlamp and placed it on the ground in the church. It features both white and red LED lights (the red is so you can see close up without ruining your night vision). I switched it to the red LED and pointed it up to a wall and left it on. 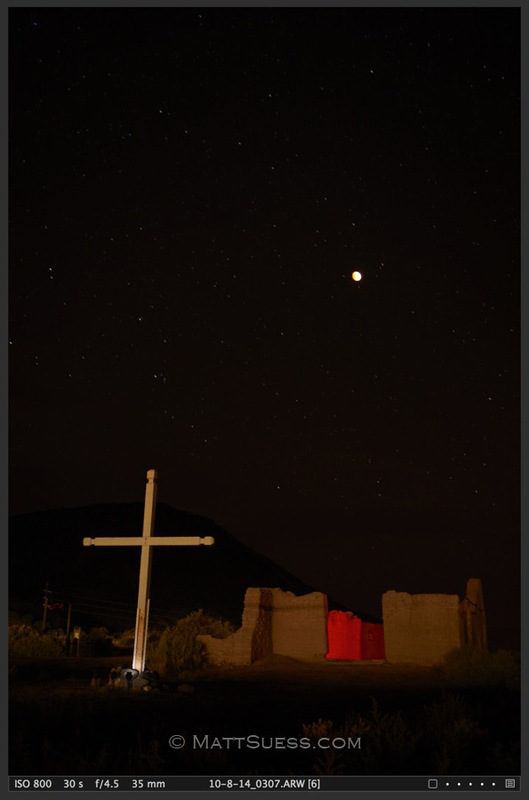 I felt having a red interior of the church would play well with the blood red moon directly above. Back at my camera I was using my Sony a7R with the Sony FE 35mm lens. During the long exposure I had another headlamp with a white spotlight I was using to paint light onto the cross and exterior of the building. Every now and then a car would pass by, with it’s headlights briefly hitting the church. This provided a 3rd light source for me and gave me all the light I needed and wanted. In between taking photos of the church I would move to my Sony a7 camera which was on a tripod with a Metabones III adapter and Canon 70-200mm f2.8 lens and take photos of just the moon during the different stages of the eclipse. As for weather I only had to deal with the occasional cloud passing by – much different than the forecast which called for mostly cloudy skies. However not long into the total eclipse when the moon was red, the winds started picking up and elevated smoke from a nearby forest fire. This would block out the moon for good stretches. But by then I knew I had the shots I needed and we left the scene while the moon was still partially eclipsed. 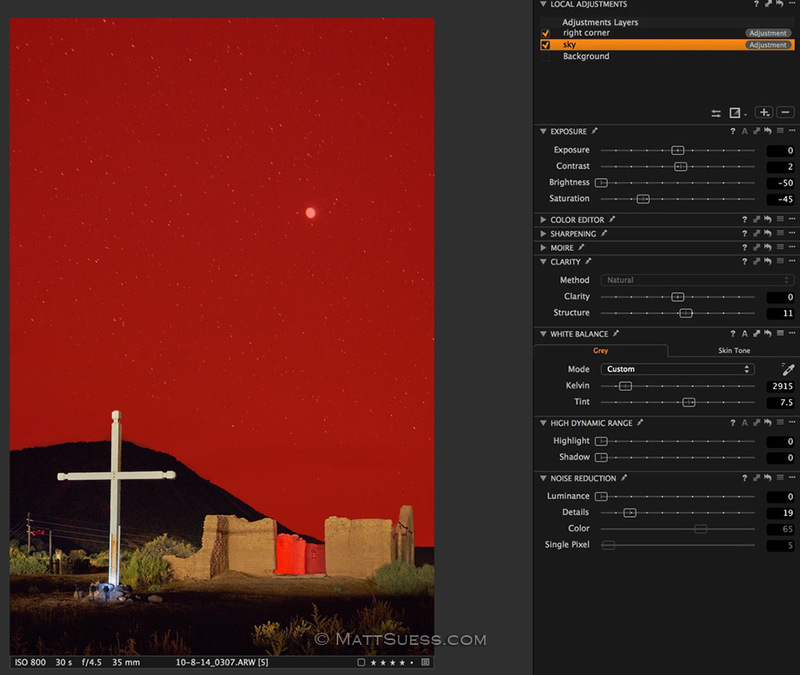 I got back to Santa Fe at 7:30am and went right back to bed for a couple hours to get refreshed, then went on to processing the photos and creating the final composite. This is the original RAW file prior to any post processing adjustments and enhancements. The bright spot in the sky is the moon when it was red during the total eclipse. My RAW files were processed in Capture One Pro 8 (C1). The fact that I can use layers in C1 gave me a big advantage in processing the wide angle shot as opposed to using a program such as Lighroom which does not support layers. In C1 once I made some global adjustments, on a layer I was able to mask out the sky to fix the color, tonality and clarity separate from the foreground. Because I was working in layers I could go back and forth between the layers to make fine-tuned adjustments. This red here shows the mask I made of the sky in Capture One Pro so I could make adjustments separate from the foreground. After making all necessary adjustments to the church photo I went on and processed the moon photos in C1. Then all 6 photos were brought into Perfect Photo Suite 9 (PPS) from onOne Software to build the composite. 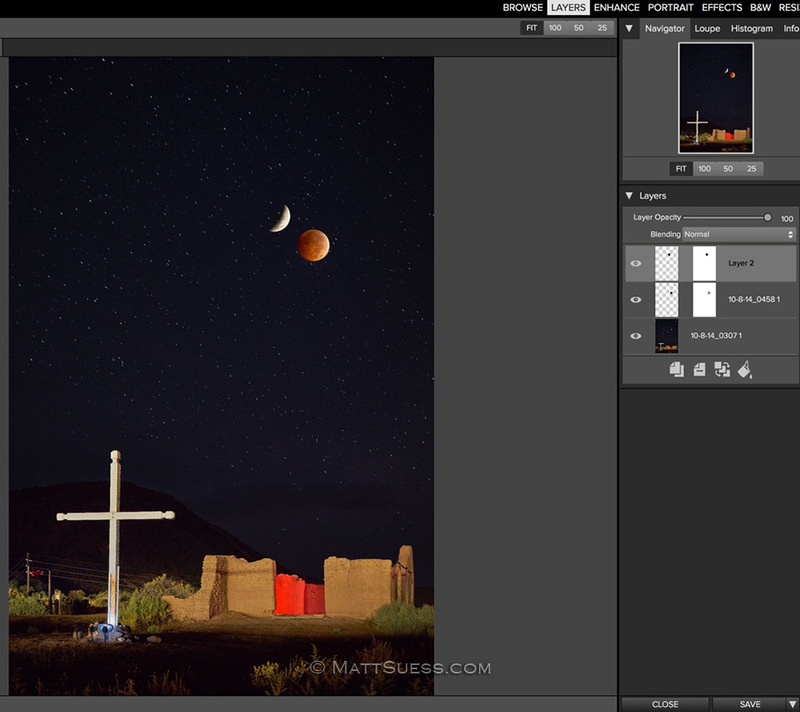 In PPS I first added the church photo, then on separate layers I added each moon photo. On each moon layer I cut out the black sky surrounding the moon, resized the moons, and positioned them just as they would have been during the stages of the eclipse. Once the moons were all set I needed to make some further tonal adjustments in PPS and clean up the image. The composite starts to take shape in Layers in Perfect Photo Suite 9. Using Effects in PPS I was able to make selective adjustments to the tone and clarity of the church and surrounding areas using adjustment brushes. Back in Layers in PPS I used the Perfect Eraser to remove all signs of the power lines along the street that were made visible from that passing car. You can see the great job the Perfect Eraser did in Perfect Photo Suite in getting rid of those power lines. I still needed to fine-tune the position of the moons and erase some stars in the background where the partial eclipsed moon would block. Perfect Photo Suite 9 by now was starting to not play nice and crash – this is only because I have an early beta of the upcoming Suite 9 which is due to be officially released by the end of the month (a must-have upgrade I must add). All beta software is prone to crashing so I opened the file in Photoshop to make the remaining minor adjustments and was finished. This photo went through numerous versions of enhancements and edits. Here you can see them all in the Browser of Perfect Photo Suite 9. I used the tutorial you created around the April lunar eclipse. Thanks to you, I got some nice exposures on Wednesday morning (Oct. 8th). I have yet to put together my composite image but I think I have some good moon exposures to work with. 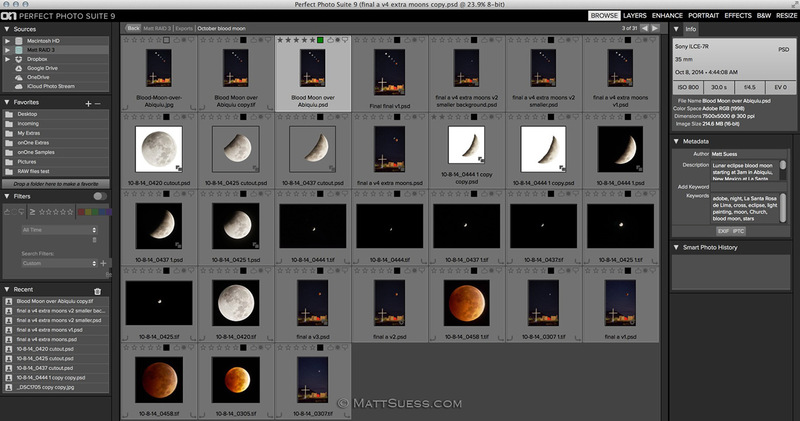 I was shooting the moon all night (especially 2:15 to 5:30 AM) from my home in Long Beach, California. As luck would have it, there wasn’t a cloud all night. The only thing that I didn’t anticipate is that my lens (actually the UV filter in front of my lens) kept fogging up so I would wipe it dry just before taking the next shot. I was triggering my Nikon D7000 with the Triggertrap app on my Android smartphone. Thank you so much for generously posting these details. I am going to take what I’ve learned and do this again in April and September of 2015. That is awesome Walter – glad the tutorial helped out and I hope you got some great shots! Interesting about your lens fogging up – I didn’t have that issue in either of my shoots. There are 2 scenarios off the top of my head I can think about that might have caused it: 1 would be the lens coming from a warm/cold place relative to the outside temp – when moving from temp extremes allow time for the camera gear to match the air temp, and 2) the dew point was very close to the air temp and was causing condensation on everything. My camera was out there hours before I started shooting but yes, moisture was forming on everything. I was surprised because the sky was clear. I think it was the only night that we didn’t have our infamous “marine layer” coming in off the Pacific. I’m already planning to go off to camp in the desert in April and/or September of ’15. Matt, you are a purist. You taught us how to layer clouds, so why not just pick your favorite night shot from the library and layer some moon shots? Regardless, I am absolutely dumbstruck with what you have accomplished in this latest creation. Anyway, first thing I’m gonna do is get me the Moon/Sun Seeker package. Awesome!